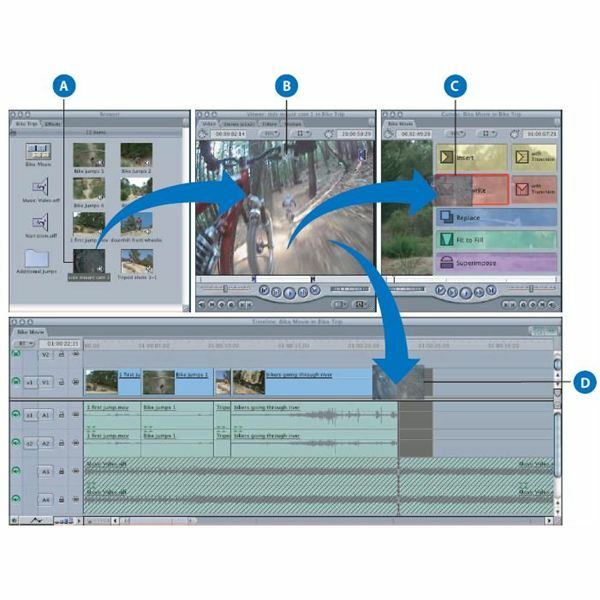 Final Cut Express HD has an easy to use interface that consists of four main windows. The Browser (A) area contains the source material. The media files are organized into projects, clips, and bins. The Viewer (B) displays the clip that is selected in the Browser. There are several editing tools in this area. The Canvas (C) displays the edited clips. It's a preview of what the movie will look like. The Timeline (D) displays the chronological order of clips and features several controls. The following editing features are used to modify individual clips and create sequences consisting of several clips. The editing process can be long and consist of multiple steps. Sometimes the final product isn't what was envisioned, and needs some adjustments. Instead of starting from scratch, use the Undo function to peel away the previous edits until you reach a place in the editing process that can be built upon. The default number of steps that can be undone is 10. To increase this, go into the General tab in the User Preferences window and set the Level of Undo up to 32 actions. To undo a previous step, choose Edit and select Undo. You can also use the shortcut, Command Z. To redo a step, select Redo under Edit, or press Command Y. Select a clip from the Browser and click the Viewer window. Once the Viewer window is active, drag the slider bar to the starting point of the desired segment. Press I to set the In point. Drag the slider bar to the end of the desired segment. Press O to set the Out point. After setting the In and Out points, view the segment by pressing the Play In to Out button. If the segment wasn't exactly the portion of the clip you wanted, adjust the location of the points by dragging them along the slider bar. If the segment is completely useless, remove the points by control-clicking the slider bar and selecting Clear In and Out. The following Final Cut Express HD tutorial deals mostly with the Timeline section. Now that a clip has been selected, it is time to add it to a sequence. Begin by setting the playhead (vertical line that indicates the time position) in the Timeline to the beginning of the sequence, which is 0. The shortcut is to press the Home key on keyboard. Next, drag the clip from the Viewer preview to the Timeline. Each clip added afterward will be placed after the previous clip in the Timeline. Control-click in the Browser window and select View as Large Icons. Arrange clips in sequential order, left to right. Click the project's tab, select File, and choose Save Project. Use the cursor and draw a box around all the storyboard clips in the Browser. Drag the storyboard to the Timeline. In the process of constructing a video, certain clips may be removed from the sequence for a variety of reasons. The content may not fit in with the narrative or the quality may be poor. One way to delete a clip is with the Lift Edit feature. This is perfect for removing a clip, without affecting the sequence of other clips. To do this, select the clips to remove from the Timeline with a selection tool from the Tool palette. Then select Sequence and click Lift, or simply press Delete on the keyboard. Another option for deleting clips is the Ripple Edit feature. This will not leave a gap in the sequence like the Lift Edit. Instead, all the clips to the right of the deleted clip will move to the left to fill in the gap. This will change the duration of the sequence. To do this, select the clips with one of the selection tools and press Shift-Delete on the keyboard.